Set amidst well-tended gardens, Aristi Studio Apartments is located in Plati Village of Lemnos, just 50 metres from the sandy beach. 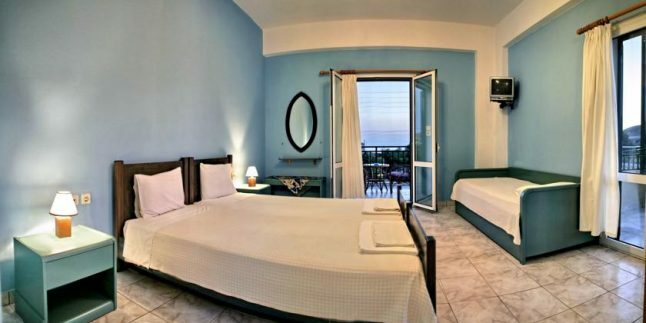 It offers self-catering units with free Wi-Fi and a balcony or patio overlooking the Aegean Sea or the mountain. Fitted with tiled floors and blue colours, the studios of Aristi have a kitchenette with fridge and cooking hobs. Each air-conditioned unit is equipped with a safety deposit box and a TV with satellite channels. The private bathroom is stocked with a hairdryer. Guests will find restaurants and mini markets at the centre of Plati Village, within 250 metres from Aristi Studio Apartments. The capital Myrina with its Venetian Castle is at 1.5 km, while the sandy Plati Beach is 3 minutes’ walk away. Free private parking is possible on site.